Go south on Coffeen (Hwy 335) 6 miles toward the town of Big Horn, turn left onto Bird Farm Road (C.R. 28). Go 1.8 miles, turn right to stay on Bird Farm Road for 1.5 miles. 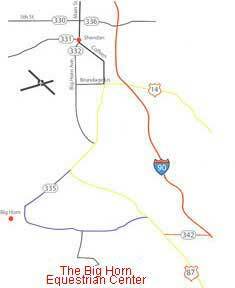 BHEC is on your right at 352 Bird Farm Road. Note: You will go past the entrance to Flying H Polo Club, and the entrance to the Wyoming State Bird Farm before you get to the Equestrian Center. If you're coming to watch Sunday polo, you may park at fieldside, on either side of the grandstands, or across the field. Tailgating is encouraged! There are food and bevearge concessions at all Sunday games, or you can bring your own picnic. After the game everyone is welcome at the Clubhouse. Click this map for a larger version. 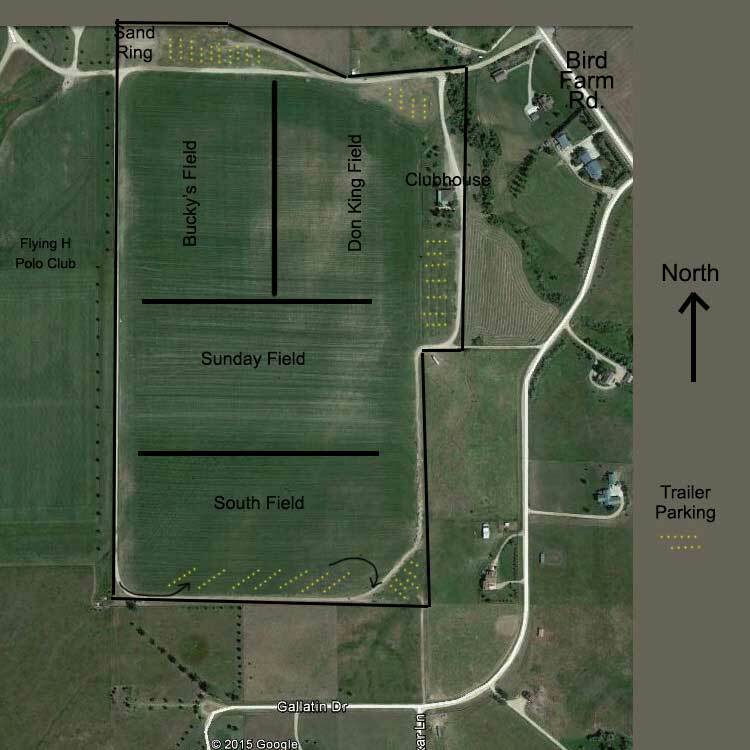 Trailer Parking - When you come for games on the north end of the club, please park on the grass between the road and the Bird Farm, or on the grass area NE of the Don King Days field. For games on the south field, you may park around the edges of the field, or on the grass area in the SE corner. 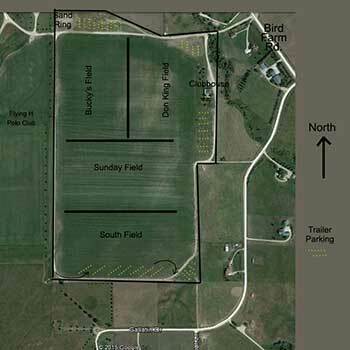 For games on the Sunday field, use the area immediately south of the clubhouse. 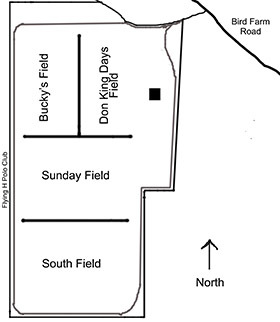 Be aware, Bucky's Field and the Don King Days Field run north-south in front of the Clubhouse, and overlap the Sunday Field. The South field and Sunday fields run east-west. Please avoid driving trailers behind the clubhouse...it creates a dust problem, and there are times when the clubhouse is rented out for private parties. They appreciate it when the rigs come in and go out using the road around the WEST side of the fields.